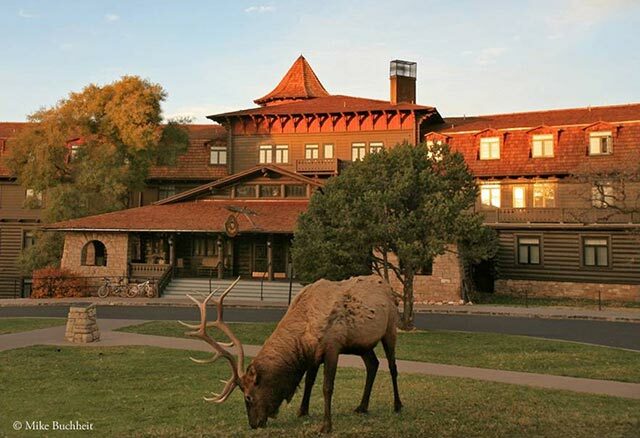 Anyone who has ambled through the Historic Village District in recent years has probably noticed the water-intensive Kentucky bluegrass surrounding the El Tovar Hotel and a few of the historic lodges along the South Rim. These non-native grassy patches are relics of a well-intentioned landscaping project in the 60s and 70s. 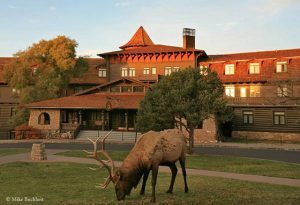 The fields of green have long been irksome to botanical purists, and irresistible to the elk and deer that feed on them at all hours of the day. The interaction between these wild herbivores and a curious public has grown tenser in recent years as the herds have swelled in numbers, creating the potential for serious harm for park visitors that wander too close. Park resource managers recently announced that the grass will be replaced by native plant species that should prove less of a magnet for the four-legged park denizens searching for a little variety in their diets. Read more by following this link, and remember to always give wildlife a wide berth. Yes it’s the law, but more importantly, it’s a common sense habit to make for a safe Grand Canyon experience for all involved.